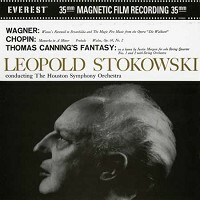 This release is a compilation of Stokowski/Houston performances recorded at Houston Civic Center by Bert Whyte and originally released in 1960. Compositions include Stokowski arrangements of Wotan's Farewell and Magic Fire Music from Wagner's Die Walkure, Mazurka in A minor, Prelude in D minor and Waltz in C sharp minor by Chopin. Also included is the not-often-performed-or-recorded Fantasy on a Hymn Tune composed by Thomas Canning. The HDAD Plus is a two-disc set consisting of a two-sided DVD-10 disc containing DVD Audio and DVD video formats, plus a bonus CD from a separate 16 bit/44.1 kHz two channel capture done simultaneously for the CD format to avoid non-integer down sampling and hence provide for maximum quality – all transferred directly from the 35mm magnetic film using a vintage Westrex 1551 tape machine.